Years before I became one of those Neil Gaiman fans, I picked up Coraline at the Vancouver airport to wait out a layover. I read the book in its entirety before the plane even boarded, and handed it off to my travel partner, throughly happy to get the novella out of my hands and out of my mind. It had, more than anything I’d ever read, given me the absolute creeps. Had I been as well-versed in Gaiman then as I am now, I would have been better prepared for his particular approach horror. He presents everything in a straightforward manner, as though the fantasical is an everyday occurrence. He weaves horror into the normal, letting it creep into the parts of the brain that positively tingle at the sight of something out of place. And then we realize that the eyes have been replaced by shining black buttons as happens in Coraline. I tend to not read books that are billed as horror. I have a weak constitution for terror. But that has made me remarkably unprepared for it when it sneaks up in books. I don’t see the warning signs; I just suddenly find myself holding my breath and listening to my own rapid pulse in my ears. And what amazes me the most is the many different ways horror can rear its head out of the blue. 1. The Sideways World. Perhaps my favorite element of horror is the character/situation that is ever-so-slightly off kilter–not enough to send up red flags of doom, but…perhaps enough to set off little internal alarm bells. Gaiman is a master of this, especially in his short stories and YA books. Coraline and the Newberry-award-winning The Graveyard Book both establish worlds that are just slightly offset from our own to such a degree that when the weird things begin to happen, the reader’s so off center that the mind cannot cope. 2. The Tilt from Normal. 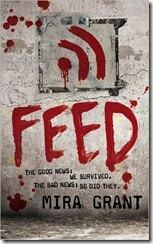 In the titular novel of Michael Grant’s Gone series, a character is holed up in a run-down shack in the middle of nowhere. And out of the pitch black night, someone is calling for her to leave the safety of shelter. Grant describes the voice in terrifying detail, the gravelly quality, as though the person has not spoken in days. How it almost sounds as though it isn’t a person speaking at all, as though it is something else, something otherworldly. Something…distinctly not human. Grant plays out the moment, so that that mind connects the dots and takes the first step off the cliff into the terrifying unknown. 3. The Relentless Rush. Unlike my other picks, which are subtle and often slow-paced, sometimes there is nothing better for a scare than the never-ending situation from Hell. I read one most recently in Mira Grant’s Feed. It was a zombie battle that went on for pages before dying down into a lull of safety. But the safety is a brief interlude before another wave hits. Then another. And every time the characters seem safe, something new is thrown at them until I am on the edge of my seat, gripped with paranoia, just waiting for the next scare to emerge. How about you Canaries? What is your favorite element of horror? Tell us about your favorite creepy scene from a book. This entry was posted in Editorial, Fiction, Horror, writing and tagged books, coraline, gaiman, Halloween, horror, reading, scary stories, writing. Bookmark the permalink. I like horror and have at times have it in heavy rotation in my to-read stack (though sometimes I just don’t want it). I’m a big fan of the sort of magical realism horror of the sort that Gaiman writes. To me, the crux of good horror, sf and some fantasy is being able to suspend disbelief, so the more credibly you put your weirdness in a calm backdrop, the better! I feel like reading Gone, now. And I adore Neil Gaiman 😉 For some reason I didn’t enjoy American Gods so much! Err. Perhaps I should finish the remaining 25% before I judge.